We are located at 1119 Camden Street in San Antonio Texas, half a block east of N St Mary’s and just a few blocks from the Historic Pearl, San Antonio Museum of Art, and the River Walk. Within walking distance are a long list of excellent restaurants, coffee shops, music venues, improv comedy, and so much more. Come climb with us then explore the neighborhood with your climbing buddies! Bouldering is a form of rock climbing that takes place close to the ground and focuses on technique, problem solving, and strength. 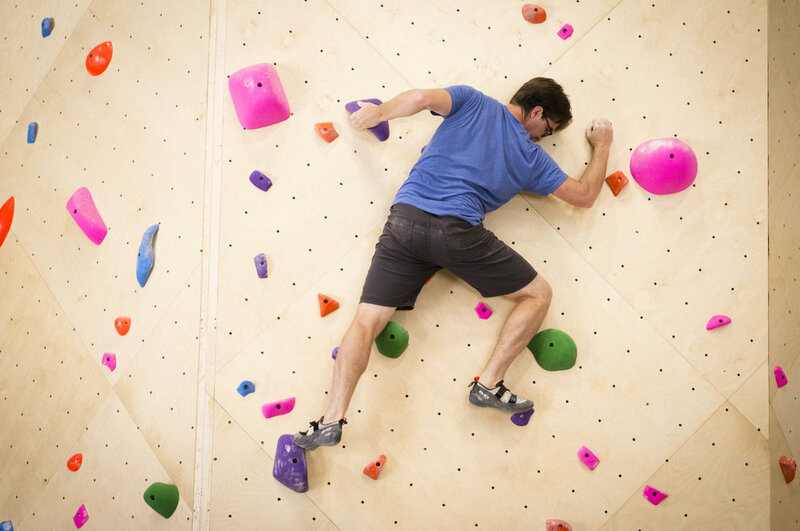 Bouldering does not use ropes or harnesses, instead climbing at heights of no more than 16’ from the ground, with large foam gymnastic-style pads to land on. DO I NEED TO BE IN GOOD SHAPE TO CLIMB? No. Climbing is a very adaptive activity, allowing you to choose a challenge for your own abilities and at every level. If you have particular concerns, we would be happy to talk with you to understand better how we can help you get on the wall. Climbing is a great activity to help you get in shape, stay in shape, and maintain a healthy lifestyle. Besides climbing walls, we also offer a fitness room, yoga classes, and Pilates classes to help you on your fitness journey. Of course, if you have pre-existing conditions that you feel might make climbing difficult or unsafe, it is best to consult a physician before participating in any strenuous activity. All you need are climbing shoes, a chalk bag and a sense of adventure and you’re ready to boulder! Kids three years old and up are allowed to climb. Kids are natural climbers, and adventurers and we want to encourage that! Kids 15 and under must be closely supervised by an adult at all times (please pay close attention to the rules regarding running, gymnastics and horseplay), but we love to see kids on our walls, making our problems look easy. If your kids love climbing, consider one of our youth recreational or competition programs to keep them active and engaged. HOW WILL I KNOW WHERE TO CLIMB? Bouldering routes are called ‘problems’, and follow a line of color-coded holds from the bottom to the top. We typically have between 100-125 problems in the gym at any time, allowing us to offer problems for all ability levels. Twice a week we will be ‘routesetting’ – the process of taking down a section of our boulder problems, cleaning the holds, and creating new routes/problems. This ensures that our climbers continually have new climbing experiences and challenges to look forward to. Bouldering is a GREAT workout! Climbing develops power, endurance, flexibility, balance and mental strength. Every boulder problem presents a unique challenge that requires different combination of movements and techniques, engaging a wide range of muscles from your toes to your shoulders in the process. Along with being great exercise, bouldering is also a lot of fun, and a highly social way to exercise. Different from the repetitive, solitary exercises of running on a treadmill or lifting weights, while trying to climb a boulder problem you will be sharing ideas with other climbers and cheering each other on to the top. This is one of the elements that makes bouldering a very addictive sport - don’t say we didn’t warn you when develop an uncontrollable urge to climb more and more! Our normal operating hours are 10 am - 10 pm. We also offer Family Climb hours on Saturday and Sunday, from 8 am - 10 am. Monday, Tuesday and Thursday we open early for our members, and are open to members from 6 am - 10 am. Join our mailing list below and follow us on social media for continued updates and offers!